The PSNI’s warning to the media that it would be “reckless and dangerous” to speculate about IRA involvement in the killing last week of Kevin McGuigan, shot dead outside his Short Strand home, has brought to the surface long simmering concerns about partial policing and prosecution decisions in the peace process dispensation that now reigns in Northern Ireland. The impression that legal authorities are putting the survival of the peace process before justice – primarily in decisions or attitudes designed to protect Sinn Fein and its allies over issues as diverse as sexual abuse and historical cases – surfaced late this week with a call from the sister of an IRA victim to replace the PSNI as lead investigator of the McGuigan murder. 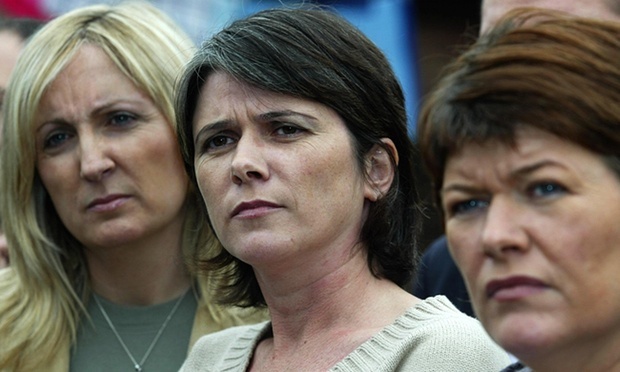 Catherine McCartney, whose brother Robert was stabbed to death by IRA members in 2005, allegedly under the control of Jock Davison whose own killer was claimed to be Kevin McGuigan, said basically that the PSNI was not a fit force to probe the incident because it put the political process ahead of objective investigation. The warning to the media that it would be “reckless and dangerous” to link the killing to the IRA was echoed by calls on the media from Sinn Fein not to be “unhelpful” by suggesting IRA responsibility. One of Northern Ireland’s most outspoken campaigners for paramilitary victims has called for the inquiry into the murder of IRA assassin Kevin McGuigan to be taken off the Police Service of Northern Ireland (PSNI) and given to an external police force. Catherine McCartney – whose brother Robert was murdered by IRA members in Belfast city centre a decade ago – has accused the PSNI of being more concerned about protecting the political process at Stormont than solving paramilitary murders. McGuigan, a former neighbour of the McCartney family, was shot dead outside his home in the Catholic Short Strand district of east Belfast on Wednesday night. The former IRA gunman feared for his life because fellow republicans accused him of assassinating the ex-Belfast IRA leader Gerard “Jock” Davison in the nearby Market area in May. A 39-year-old woman and a 44-year-old man were arrested in east Belfast on Thursday in connection with the killing and are being questioned by police. They were detained a short distance from where McGuigan was gunned down in front of his wife at their home in Comber Court. Analysis Is the Provisional IRA anti-drugs unit back in action? Criticising the PSNI for failing to state which, if any, organisation the McGuigan suspects belonged to, Catherine McCartney said only an external police force could properly investigate such murders. The McGuigan killing has further destabilised the already fragile power-sharing executive at Stormont. Northern Ireland’s first minister, Peter Robinson, warned on Thursday that Sinn Fein could be expelled from the power-sharing coalition if IRA involvement in the murder was proven. Sinn Féin’s former Lord Mayor of Belfast Alex Maskey vehemently denied any IRA connection to the killing. Republicans in Belfast have repeatedly blamed McGuigan for murdering Gerard Davison in May; McGuigan consistently denied he had anything to do with it. Davison was shot dead in Welsh Street as he was walking to work at a local community group. He is believed to have been personally responsible for or ordering the deaths of up to 15 men from the early 1990s onwards, many of whom were accused of drug dealing within nationalist areas of Northern Ireland. He was also accused of giving the order to attack Robert McCartney, a forklift truck driver who was murdered outside a Belfast bar in 2005. The McCartney family have alleged that the PSNI investigation into his murder was hampered due to the protection of informers inside the Belfast IRA and political considerations. Catherine McCartney and her sisters launched a global campaign to try and bring their brother’s killers to justice. They were invited by George W Bush to the White House and also met the late Ted Kennedy, who lent his support to their campaign. A decade on, no one has been convicted of their brother’s killing. Mccartney would still be alive if he hadn’t shouted out that the O.C’s wife in the markets had “a fat arse”. We do not have police, we have a rebranded B Special/RUC joke. Who murdered Eddie Fullerton?